I am afraid of heights. Now you know. That is one reason I was helplessly engrossed in "Man on Wire," the story of how Philippe Petit crossed eight times on a tight-wire between the two towers of the World Trade Center on Aug. 7, 1974. Another reason is that the documentary, a hybrid of actual and restaged footage, is constructed like a first-rate thriller. Early in the film, we see what we think is sadly familiar footage: Construction workers and huge trucks and cranes, at work in the footprint of one of the WTC towers. At first I thought this was film of the clean-up after 9/11. As the scene develops, I realized I was watching an early stage in the construction of the towers. The film shows the towers growing, huge steel beams being lifted, the puzzle being put together. As it happens, 9/11 is not even mentioned in the film, which is the right decision, I think. "Man on Wire" is about the vanquishing of the towers by bravery and joy, not by terrorism. We meet Philippe Petit, a French wire-walker, magician, unicyclist and street performer, who tells us he was sitting in a dentist's office when he saw a drawing of the proposed towers and knew he was destined to conquer them. He drew a pencil line between them. His wire. The film will follow his campaign, as he enlists an unlikely cadre of helpers, draws inspiration from his girlfriend Annie and becomes obsessed with those two magnets acting on his personality. 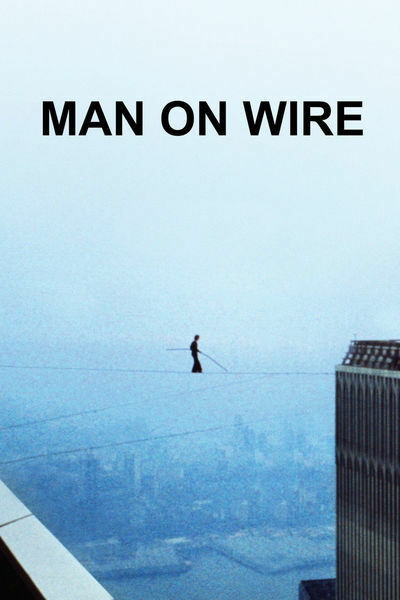 "Man on Wire," directed by James Marsh ("Wisconsin Death Trip"), has access to all of Petit's film, video and photographs of the assault on the towers. But there is more than that. Ingeniously using actors and restaging events, Marsh fleshes out the story with scenes that could never have been filmed, such as the episode when Petit and a partner crouched motionless under tarps on a beam near the top floor as a security guard nosed around. Petit has gathered a motley crew, including a pot-addled musician and an executive who actually works in an office in one tower. He trains these amateurs on how to rig a high wire. Properly, he hopes. This new footage is integrated seamlessly into the old; I gave up trying to decide which was which by the look of the picture, although a few sequences (shadows climbing a staircase) are obviously CGI. Marsh is dealing with an event almost 30 years old, and when he shows the same people at two stages of their lives, I assume either the younger or the older one is the actor, but I couldn't always be sure which. Philippe Petit is himself, both now and then, speaking fluent English, excited, passionate, voluble. Even as a child, he liked to climb things. No telling why. He taught himself to walk on a wire, practiced endlessly, dreamed of conquering the clouds. He rehearsed on wire strung up in country fields. His first great feat was to walk on a wire between the two bell towers of Notre Dame. Then he walked between the towers of the Sydney Harbour Bridge in Australia. As the World Trade Center was growing, so were his ambitions. He never just "walked" on a wire. He lay down, knelt, juggled, ran. Every wire presented its own problems, and in rehearsing for the WTC, he built a wire the same distance in France. To simulate the winds, the movements of the buildings and the torsion of the wire, he had friends jiggle his wire, trying to toss him off. His balance was flawless. He explains how a wire can move: Up and down, sideways, laterally, and it also can sometimes twist. The installation of a wire between the two towers was as complicated as a bank heist. He and his friends scouted the terrain, obtained false ID cards, talked their way into a freight elevator reaching to the top -- above the level of the finished floors. Incredibly, they had to haul nearly a ton of equipment up there. You may have heard how they got the wire across, and how they guy-wired it, but if you don't know, I won't tell you. They did it, anyway. Their plan worked. And on the morning of that Aug. 7, Petit took the first crucial step that shifted his weight from the building to the wire, and stood above a drop of 1,350 feet. Many people know he crossed successfully. I had no idea he went back and forth eight times, the police waiting on both sides. His friends shed tears as they remember it happening. It was dangerous, foolhardy, glorious. His assistants feared they could be arrested for trespassing, manslaughter or assisting a suicide. Philippe Petit was arrested and eventually found guilty. The charge: Disturbing the peace. "Man on Wire" won the Audience Award and was named best documentary at Sundance 2008.